(C) CASAREAL, Inc. All rights reserved. 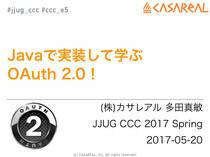 Enjoy OAuth 2.0 & Spring Security 5.1! !